Back in 1959, early in his career as a Kodak chemist, Donald Batesky was lead author of a paper in the Journal of Organic Chemistry. Now, at 85 years old and in his “third career” as a research associate in the Department of Chemistry at the University of Rochester, Batesky is lead author of another paper in the journal—a “featured article,” no less, selected as an “editor’s choice,” and the seventh-most read article in the journal for the previous 12 months. According to associate professor of chemistry Dan Weix, Batesky discovered a “new solution to a long-standing problem in purification.” Batesky made the discovery in Weix’s lab when he added zinc chloride to a solution containing triphenlyphosphine oxide. Triphenylphospine (TPP) is widely used in organic chemistry as a reagent to synthesize compounds. But in the process, TTP is converted to triphenlyphospine oxide (TPPO), which can be very difficult to then separate from the reaction product. “It contaminates the product you’re making,” Batesky says. 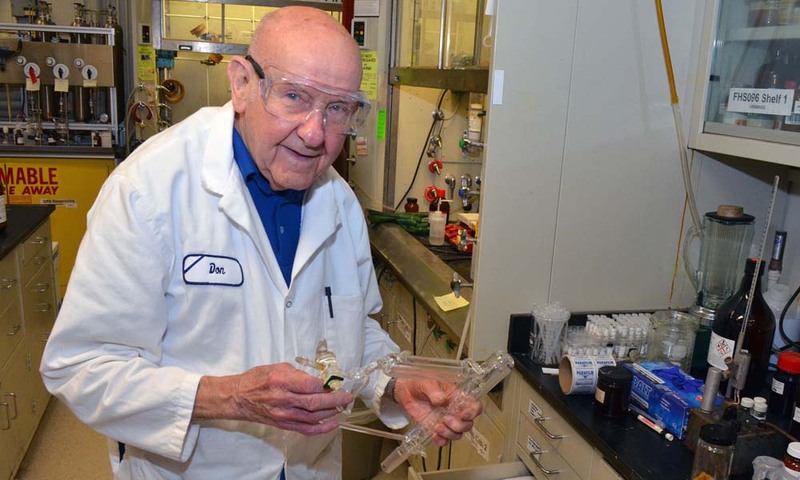 Batesky, a Rochester native, has been trying new combinations of chemicals in industrial and academic labs for more than 60 years, including as an undergraduate at Purdue University in the early 1950s. “At that time, anyone who studied chemistry and came back to Rochester was going to work for Kodak,” Batesky says. He started at $88 a week as a production chemist, working for the company’s Eastman Organic Chemicals line. Triphenylphosphine was among the chemicals he produced—and a host of others. When outside companies requested chemicals not found in Kodak’s catalogue, Batesky would make them as custom jobs, 10 or 20 grams at a time. “I did 11,000 literature searches and made 3,000 chemicals in 15 years, which is one per working day,” he says. “I held the record with 22 lab notebooks. Photochromic chemicals that darkened in the sun. Liquid crystals. Hundreds of the chemicals he custom produced were subsequently added to Kodak’s catalogue. Eventually he became operations manager at a salary of $100,000 a year. After a brief retirement to enjoy time with his grandson, Batesky worked as a contract chemist for the Aldrich Company for 15 years. He spent many of those years working alongside two other former Kodak chemists in leased laboratory space in Hutchison Hall, hence Batesky’s acquaintance with the University’s Department of Chemistry. After his contract with Aldrich expired, Batesky worked for four years in Weix’s lab. Now, he’ll be sharing his 25-hour week working for Robert Boeckman, the Marshall D. Gates, Jr. Professor of Chemistry, and for the Laboratory of Laser Energetics. Batesky is thrilled to still be contributing to his field long after many people would have retired. “I’m having a circus; it keeps me going,” he says. “I’ve told my daughter I’ve got a lab coat I want to wear when I’m displayed on the final day. It’s got my name on it. It’s brand new. And it’s hanging in the lab over there,” Batesky adds, gesturing toward a closet. The diseases that claimed his two wives and a girlfriend are further motivation. “If I could only do something, make something [in the lab] to help cure one of these diseases, it would be great,” Batesky says. In the meantime, he enjoys working with students who represent the up-and-coming generation of chemists. “They’re super intelligent,” Batesky says. “But they’ve got a lot to learn. I hope I can help prepare them for what they’re going to be facing” when they graduate and begin their professional careers. In that way, too, Batesky has made a big contribution, Weix says.